He seems to give Samuel L. Jackson a run for his money with the amount of work he has done in film, theater, television, stand-up comedy and one-man shows. 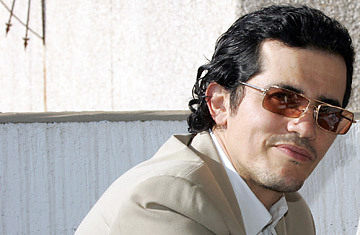 But John Leguizamo, 44, who stars in the ensemble dramedy Nothing Like the Holidays out Dec. 12, thinks carefully about his performances  training he got mostly from his work on shows like Freak and Mambo Mouth. Leguizamo talked with TIME about the new movie, marriage and the abrupt cancellation of his Broadway show American Buffalo. Two reasons. One I thought the script was really good. Really funny and really complex. Two, I felt like we need a Latin holiday movie. We've seen lots of white holiday movies. We've seen some black holiday movies, but we've never seen a Latin holiday movie, so it's about time. You're a New Yorker and this film was shot during a frigid Chicago winter in the mainly Hispanic neighborhood of Humboldt Park. Have you shot there before? I've never shot in Chicago. I've always done my one-man shows in Chicago because I found it to be sort of like New York on valium. It's got the hipness and coolness of New York without the extra stress and anxiety. The film seems to be more about family than family hijinks like other typical holiday films. Do you think one works better than the other? Yeah, like somebody putting up the Christmas lights and then they fall off the roof. (Laughs) I feel like the comedy that I've always tried to do my whole life and that I really dig is comedy that's edgy, that's very moving and powerful and still hilarious. I don't feel like you have to sell one out for the other. I don't think they have to be mutually exclusive. Your character in the film, Mauricio, has a short monologue where he explains why marriage is worth fighting for. In your show Sexaholix there's a line where you tell your daughter, 'You know I love your mother too much to marry her.' And now you're married. What do you say to that now? I still think marriage is more than a ceremony and a document. It's definitely a commitment that two people make and I don't know if you need all those elements to make it a marriage. To me marriage is a devout commitment to make things work and figure it out and fight to stay together. I think you have to really make that commitment in your soul. Both people have to. Mauricio is married to a Jewish woman and in real life you are as well. Was that written in for you? They never said it was written for me. No one's told me the truth. It's too weird a coincidence. It made it great, too, because that's my life  I had lots to draw from. My wife knows that [my family members are] all very passionate and we talk about everything and there's no holds barred when we get together. We talk about everything and anything loudly. Looking at your career in general, you've done pretty varied kinds of work. Have you developed a rhythm or order for what projects you work on and when? I definitely have a rhythm to my game and a system. I'm doing projects that I'm really passionate about more than before. Before I would do things that I thought would be exciting or fun to try. Now I pick things that I'm incredibly passionate about, so that's made a difference. I want do a lot of movies. I definitely want do more theater. I want do my own one-man show. Is there any role that you won't play or that you won't play anymore? There's nothing that I wouldn't repeat if there was a new take or new dimension to it. A great role in a great screenplay, I'll never say no to. There are a lot of areas that I really want to approach. I would love to do more "real person" screenplays, somebody's life, like the average hero. I think there's a ton of historic Latin people whose stories need to be told. My dream is to do what I do on stage, on film. That's my huge quest in life. I want to take the comic, satirical, dark stories that I really am attracted to and put that on film. You shot a pilot for CBS a couple years ago. But you seem to gravitate more toward film and theater. Are you still thinking of doing a TV show? I don't think I can do network. It was a great lesson for me to know that it's not really my thing. My favorite mediums are theater and independent films. Maybe cable is the next thing that's close. I think FX or Showtime or something on HBO. I love Californication. I love Weeds. I love Rescue Me and It's Always Sunny in Philadelphia. There's an edge to these shows. You feel like it's artist-driven, not company driven. You had great success on Broadway with your one-man show, Freak. Your most recent Broadway show, a revival of David Mamet's American Buffalo ended abruptly after a week-long run. Was it just about ticket sales and the economy? I think it was a combo of things. I had a suspicion but I didn't really listen to myself. I love the play and I was really born to do it. I may tackle it again at some other time because really, I thought me, Cedric [the Entertainer] and Haley [Joel Osment] were taking it to a whole new level. No one's ever brought out the love between these guys or the violence that we put in it or the humor. But we got shortchanged in the schedule, man. It's a great lesson for me that I'll never do a Broadway show unless we test it out of town and have at least four weeks of previewing. I only had 10 days to preview and I kinda felt it was short. I asked around and everybody was like, 'No you'll be fine. You'll be fine.' And I was like, 'Are you sure?' You gotta look out for yourself because nobody else is looking out for you. It's a huge lesson that I have to keep relearning. But I'm definitely talking about doing other theater pieces, though. I love theater. I love it. When it's well done, theater is a religious experience. After your 2006 book Pimps, Hos, Players, Haters & All the Rest of My Hollywood Friends, where you dished some dirt on public figures, there was a lot of talk that it would hurt your career. What's the verdict on your end? Well there were a lot of people who were upset with me and I heard that people wanted to beat me up. For real. But it's all good. None of it came to pass and I was OK with it. But no more books for me. I'm done with that. It was so difficult and it's not my thing. There's another movie out Dec. 10 nationally on video-on-demand on IFC, Where God Left His Shoes. It's a very dramatic, sort of anti-Christmas movie, which is my favorite genre. (Laughs) Anything anti-. I'm anti-authority, anti-society, anti-social. It's about this Daddy who's a boxer. He loses his job during Christmas and he spends his time trying to get six jobs and he fails at all of them. [Writer/director Salvatore Stabile] raised a million dollars for the homeless with the movie. It won the Humanitas [Sundance Film Category] Award for writing. I read it and it just broke me down. I guess being a man you have this fantasy that you have to succeed, and you're the provider and the glue to the family and all that responsibility. What happens when you fail at that? Then there's Ice Age 3 in 3D out next summer. What I love about Ice Age unlike other animation that is so concept-driven and plot-driven is that they try to be like the old Chuck Jones and Fritz Lang. It's the independent film version of animation. They let character moments and little beats play out for the sake of letting them play out and then they come back to the story, which is so hard to do. My kids have two little parts in the new one and they're so proud of it.